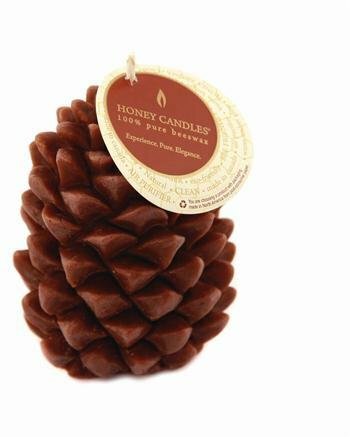 Size: 4 1/4" x 3" Unique and long-burning, the Ponderosa Pine Cone is a wonderful decorative candle, perfect for the autumn holidays, as a gift, or as a home decor item. Pair it with any natural, red or tangerine color. The result is stunning! The Ponderosa Pine Cone is eco-friendly and good for your health, handmade with absolutely no carcinogens or hazardous products, and a long smoke-free burn that emits special compounds to neutralize airborne allergens and toxins. You'll love the soft honey aroma, and the characteristic warm glow of a pure beeswax candle, with a natural light that closely resembles that of the sun.